The performance of Villo! stations around the EU buildings in Brussels was monitored and mapped for one working day in June 2013. 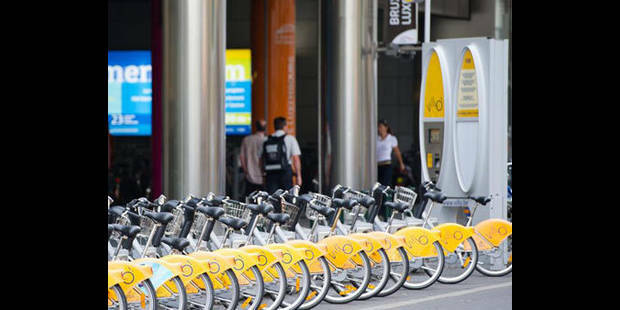 ‘Total bikes’ means is the total number of working docks at each station. Data is served by a developer portal of JCDecaux, and was gathered by the WhereismyVillo! Here is the average performance of the 17 stations near European Commission buildings per one working week in the month of June 2013. ‘% availability’ means the proportion of docks where a bike was available: so 0% means 0 bikes available, 100% meaning all bikes were available. As you can see the main problem is finding a bike during the afternoon. In the morning the service works quite well (probably because a service van replenished the station first thing in the morning). But during the afternoon, between 13:00 and 18:00, it becomes much more difficult: six out of the 17 stations ran out bikes completely at 14:00. Later during the evening the service improves. EUCG would be interested in your experiences with Villo! in the EU quarter. Feel free to leave a comment or drop us a line. Staying for some days at L41: yesterday Dec 2nd around 6 pm, I tried to buy a 7 day Villo ticket rue de Spa down the street from J54. After a lot of spinning around the machine refuses my credit card. Twice. No worries. I go to the corner of rues Belliard et Science: no ticket machine? Okay. Let’s try Arts/Loi. The station is full of bicycles! The machine screen is down… Madou? Press 2 then 2, then 0, then V, chose pin code, insert pin code again, insert card, wait, pin, wait, code bon, wait, wait, the ticket is not coming out… Ouch! the only standing bike is not available…, But here comes the ticket! Ok, good. I walk down to St Josse church: plenty of bikes! (but no ticket selling machine). I take the bike #17 (my lucky number) and uphill to Clovis (300m). I’m home! Quite an adventure!